My gardener came yesterday. She usually comes on Thursdays, but it rained on Thursday, so it was a good thing I caught that nasty virus and had to work from home yesterday. I love going out to the garden with Marsha because she teaches me so much, and we have become friends. She is super busy, though, so I don’t like to miss a garden day, especially now, when the end of the season is fast approaching. 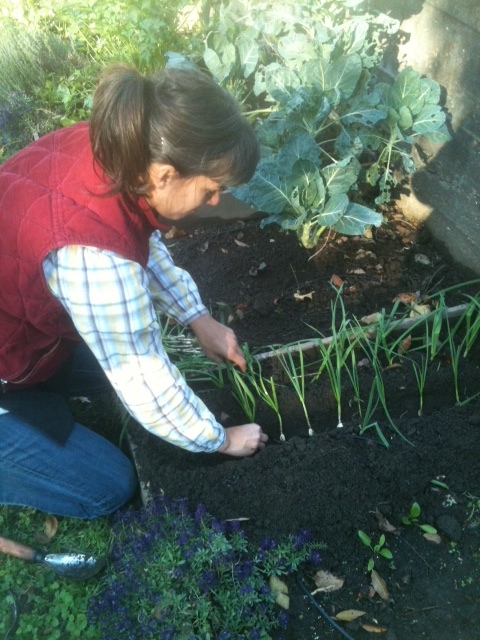 We also planted several fall crops that will keep producing for a while. I consulted this article on fall gardens to see what I need to protect for light frosts, and what I can count on sticking around for a while (there is a table at the bottom of the page). We don’t actually have a lot of the veggies that are listed in the semi-hardy vegetables list, but I will definitely be protecting my beets! We got several in the spring, the first time our beet crop was successful, and they were so delicious, I want to get these if I can. They are coming along, but not quite done, so if there is a light frost, I will be covering them. Also, there is some arugula that I just love–that peppery bite is perfect for so many things–so I will be protecting that, too. I have some experience with vegetables sticking around after hard frosts, so I knew I would continue to have some produce well into fall and even winter, but the garden is so much bigger this year, there are more options. For instance, the first year I had the garden, I picked my last Brussels Sprouts on Thanksgiving morning, and my thyme didn’t even seem to notice this past winter, but this year is the first time we have had any luck with the broccoli, so I was really excited to see that is a hardy vegetable. We have a lot of radishes out there, too, so I am glad to see we don’t need to rush to finish those. We also have turnip, mustard greens and kale, which we will use for as long as they produce. In fact, a good freeze makes the kale sweeter, and even better in our morning smoothies. The fall planting of spinach didn’t really take this year, even though we planted a whole bed with seeds. I was so disappointed, but I am hopeful it will reseed itself and come back early in the spring–one of the plants did that last year, which I didn’t even know was possible. We had spinach before the garden was even officially started for the year, and that plant was the most prolific of the spinach plants. Marsha tells me the carrot seeds that we planted, but that didn’t grow, will possibly come back in the spring and start early, too. Our gardening is turning more and more to preparing for next year. Since I have so much more garden space this year, we have the space to produce more of the things that we use a lot, rather than a little of a lot of different things. So, we are going to do one whole bed of garlic, and planting now for a harvest next June makes for bigger garlic bulbs, hooray! We had several shoots from missed or broken cloves in our harvest this year, and yesterday Marsha moved those over to the new bed, spacing them so they have plenty of room to grow. We only filled about half of the bed, so she will bring more next week. I will be bringing in some herbs to grow in pots, soon. My Thai basil is completely flowered, so I won’t bother with that, but the pesto basil looks good still, and I have two rosemary plants that can come inside. The thyme and parsley I will leave in place, because they are hardy, but I am not sure about the others. The oregano, I will probably leave, because I know it is a perennial, but I don’t know what to do with the tarragon, lemongrass and garlic chives. Research time, I guess (also: research recipes for tarragon; it’s growing beautifully, but I am not sure I have ever used it). It is also nearing the time to start reviewing more of what went well, what didn’t, what we used, what we wished we had more of, what just sat out there untouched, and plan ahead for next year. I spend much of the winter doing that, honestly, because I miss my garden. I love growing real food in my own yard, and I especially love going out to pick fresh ingredients while I am making a meal. How awesome is that? You can’t get any fresher. I can’t imagine doing without a garden now that I have had one, and I may even expand more next year–at least to some fruit trees. Does anyone else have end of gardening thoughts to share? Does anyone do any indoor gardening, beyond a few herbs in the window?